Adoption of improved technologies brought prosperity to the blackgram growers. 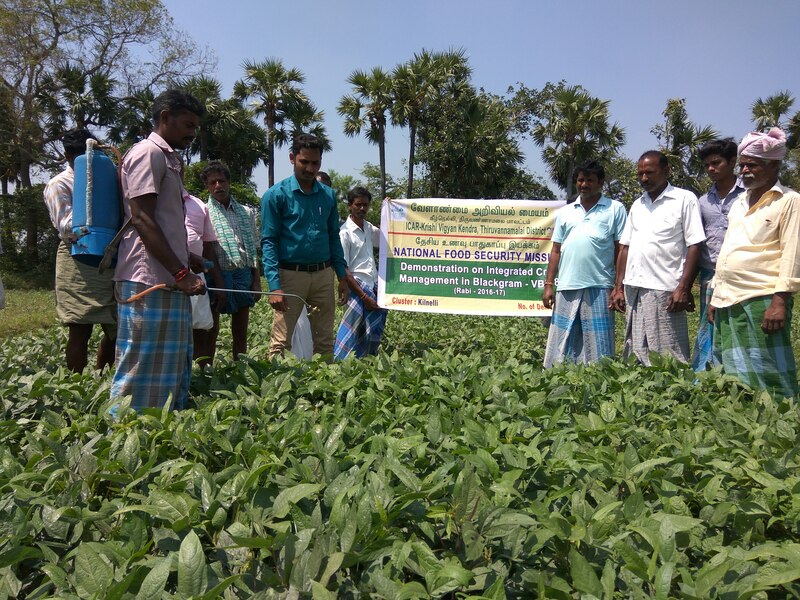 Blackgram is one among the major pulse crops cultivated in Ariyathur village of Vandavasi block of Thiruvannamalai district during Kharif and Rabi Seasons in an area of 232 ha. The productivity of the crop was low due to less awareness towards high yielding varieties, non availability of quality seeds and non adoption of integrated crop management practices in blackgram. The average yield obtained by farmers was 5.6 qtl/ha which was 37.7 % lower than the potential yield. And the income of the farmers (Rs. 36400/ha) was not satisfactory. To address these problems faced by the farmers the KVK Thiruvannamalai had implemented CFLD on blackgram in ariyathur village. The scientists of KVK analyzed the problems of farmers through group meetings in ariyathur village prior to the implementation of cluster Front Line Demonstration programme under National Food Security Mission. The KVK had selected 50 progressive farmers for implementing the cluster front line demonstration programme. The KVK has demonstrated the new high yielding disease resistant black gram variety VBN-8 (8kg/ac).